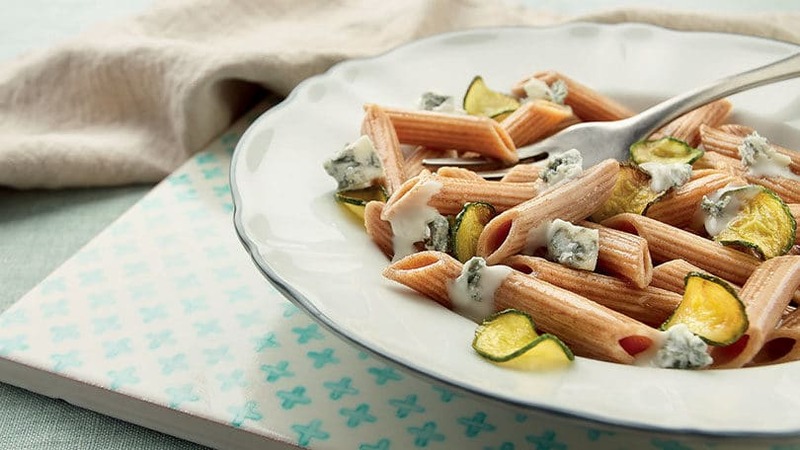 120 g (4 1/4 oz) of strong Gorgonzola, 300 g (10 4/7 oz) of wholespelt penne, 3 small courgettes, 1 clove of garlic, extra virgin olive oil. Finely slice courgettes and add them to a fried mixture composed by a clove of garlic, oil and a tablespoon of water. Add salt and sauté them covered for around 20 minutes (they must be soft and tasty). Leave them in the pan and remove the garlic. Cook and drain the pasta, pour it into the pan with courgettes and mix all the ingredients. Now add the pieces of strong Gorgonzola and cover the pan for 2 or 3 minutes until the cheese gets softer.